Hurt in Body and Mind, A Lawyer Battles On. (Foreign Desk) Neela Banerjee. A little more than a decade ago, Lahib Naoman's large house was filled with expensive furniture, exotic birds and, by her reckoning, 12 poodles. Today, it is utterly bare but for two rooms -- one where she hangs her wash, and the other where she keeps a few sticks of furniture, a box of sickly kittens, and her thoughts scrawled over the walls in a palimpsest of resistance and hope. It was as much a declaration against the authorities that once ran this country as a desperate refusal to acknowledge all that was apparent around her. 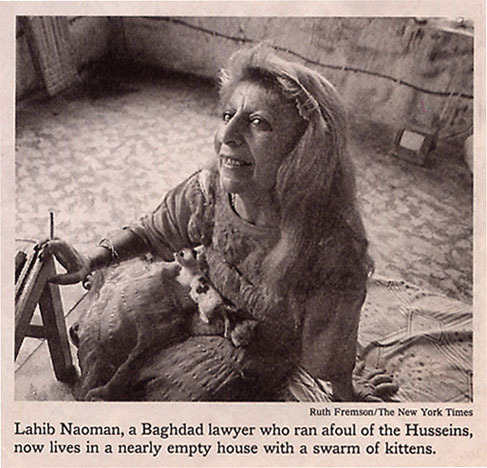 Ms. Naoman's journey to this dusty room on a quiet street of tidy homes in Baghdad began more than 20 years ago with her decision to practice law in a country devoid of justice. She then chose to defend a man who faced the harshest of punishments for allegedly committing the pettiest of crimes, stealing a videocassette recorder belonging to Saddam Hussein's son Uday. When silence and submission were the currency of Iraqi life, Ms. Naoman dared to speak her mind. For her persistence, Ms. Naoman, now 48, spent 17 years in and out of Baghdad's prisons and psychiatric hospitals. She is free now, and the Husseins are gone. But in many ways, despite her bubbly, expansive nature, the punishment continues. Those who know her, and Mrs. Noaman herself in snatches, describe the high price of her defiance: the slow decline of a prosperous lawyer to near destitution and uncertain sanity, the steady blurring of the boundary between resistance and reason. Ms. Naoman was one of 12 children born to a wealthy Christian family. Her father, she said, represented foreign companies in Iraq. She remembers as a child playing with the pets of a neighbor, Abdulkarim Qasem, Iraq's president from 1958 to 1963, before he was overthrown in the coup that led to Saddam Hussein's coming to power. She graduated from law school in Baghdad in 1978 and worked as a criminal investigator for the Justice Ministry. She studied criminology in Paris, too, and after returning to Iraq in 1985 became a defense lawyer. That year, a prison guard came to her office and begged her to defend Nadi, an Egyptian working as a cleaning man who faced death for the theft of Uday Hussein's VCR, a crime the guard said Nadi did not commit. Hesitantly, Ms. Naoman agreed to visit Nadi in jail. The door to the interrogation room was ajar when she arrived, and she saw Nadi's questioners repeatedly shove his fingers into an electrical socket. Each time, he screamed, ''I'm innocent.'' She decided then that she had to take the case. She won, Nadi was freed, and she bought him a plane ticket back to Egypt. But the victory set her afoul of the Husseins, and a week later her own prison odyssey began. The police arrested her for talking about the case, denouncing torture and criticizing the justice system. The authorities took her to Qadimiyah prison, where she was held for nine months and beaten regularly. Ms. Naoman's sister got her out of jail by having a doctor at Al Rashad state psychiatric hospital falsely attest that she was a paranoid schizophrenic. It seemed the lesser evil. Ms. Naoman went to the hospital for a month, and she was treated as if she were indeed mentally ill, with shock therapy and heavy drug treatments. In 1986, she was arrested again for denouncing the Husseins, which she said she did not do. She was sent to Zafariniyah prison for more than six months. In 1987, the government stopped her from practicing law, and her annual trips to prison resumed. But she had already decided that if the state was going to harass her, she might as well give it good reason. She spent the next several years in and out of prison, always saved by being taken to the relatively kinder hell of what she calls ''the hospital of madness.'' In one jail she was sexually abused by female inmates. By the early 1990's, the cycle of torture and hospitalization began to erode her mental health, said neighbors in the Khadir quarter where she lives. Always elegant, Ms. Naoman began to appear undressed in the street, neighbors said. She threw out and gave away her expensive furniture. For all her eccentricities, Ms. Naoman startles with the clarity of her perception and speech. Her stories, especially of the 1990's, when she spent much time in the psychiatric hospital, sometimes stretch belief. But she lived in a land where impossible cruelty was a daily possibility. She said that last year a state security official passed a message to her from Uday Hussein, her old nemesis, asking her to be the lawyer for the national Olympic Committee. The official said Mr. Hussein was impressed that she had stood up to the government all those years. She refused, and she was drugged and raped as a result, she said. A few months before the American invasion this year, Mr. Hammashe, her old classmate, said he saw her at a courthouse, trying to be reinstated by the bar. She told him she was getting better. But only Ms. Naoman seems certain she has won her battles. The bar association backed her request to begin practicing again, she said, but a new government would have to approve it. For now, her house remains mostly empty because of arson in 1993. Ms. Naoman, who never married, lives in penury, helped by a sister and some neighbors.